Animal adaptations are all around us, and the ocean is no different. In the deep sea, where light only penetrates a few meters, animals have evolved in many ways in order to survive. The unique navigation techniques of marine species are an example of these adaptations. 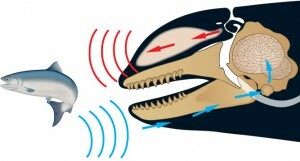 Echolocation, familiar to many as a form of bat communication and navigation, is used by several marine species including toothed whales and dolphins. Similarly, seals have developed large whiskers which they use to navigate the deep. “When a dolphin scans an object with its high-frequency sound beam, each short click captures a still image, similar to a camera taking photographs,” said John Kassewitz, founder of the research organization Speak Dolphin. Toothed whales also use echolocation to find their way in the ocean, as well as to identify prey. When swimming normally, the sounds they emit are generally low frequency. Echoes from these sounds provide information about the seafloor, shorelines, underwater obstacles, water depth, and the presence of other animals underwater. A recent theory even suggests that whales might use high intensity, focused sounds to stun or disorient prey in hunting. Likewise, seal species have developed methods to navigate the deep sea without sight. To follow their prey, harbor seals use their large whiskers, which are specially shaped to sense the movement of water as prey swims away. By detecting these vibrations in the water, seals are able to follow and catch prey in the dark depths of the sea. These examples are just three of the countless, amazing adaptations marine species use to fine their way in the ocean!